Supersolid’s Home Street brings the best of both worlds to your mobile devices. 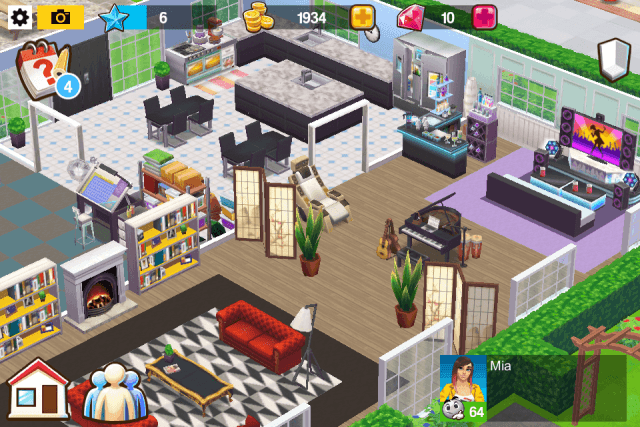 It combines house decoration with life sim elements. The game lets you choose your avatar and customize it, make new friends, build a community and most importantly create your dream home. You can remodel your house by placing new tiles, adding state-of-the-art furniture such as big-screen TV, entertainment center, hot tub, sofa-sets and many more. There’s no winning or losing, just creating the best home and building a strong community full of like-minded individuals who would love to make the virtual town a better place to live. Tap the cloud callout. At the top of the screen is a list of thoughts, such as “Creativity”, “Fun”, “Knowledge” and “Imagination”. Create multiples of these thoughts by tapping on them. For example, if you want to generate “Knowledge”, tap and it will appear on an empty slot. Make sure you have at least 1 thought. (For more on how to get it, refer the next section.) It takes some time to generate a thought, and the time taken to make one varies from one thought to another, so you will have to wait for a few seconds or minutes before using it. Once a thought is generated, you can use it to make items at workstations. Build a workstation by tapping the shopping cart icon. You will find a list of workstations under the bag icon. New workstations are unlocked when you reach a new level. Try to build all unlocked workstations to create various job-related items. Things created at the workshop can then be used to complete jobs. 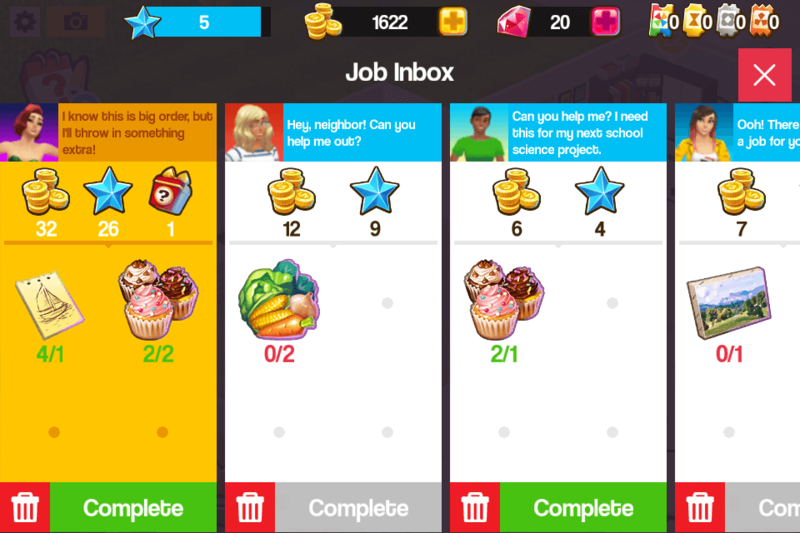 Tap the smartphone icon to get a list of jobs and complete them by creating the required items using thoughts to get rewards. Creating thoughts, using them to make items and using items to complete jobs is the sure-shot way to earn XP and coins faster. Make sure you keep the cycle going to get coins and XP. The market is the first place to look for thoughts. Most players will sell extra thoughts for coins. Tap the red-green arrow icon on the bottom of the screen to access market. To get a sales list, tap the “world” tab. Now tap a profile pic of a player just to check what he has to offer for sale. It could be anything, from items to thoughts. Make sure you quickly purchase a thought as most items are sold very quickly. You can also check what items your bookmarked players are selling by tapping the “Friends” tab. You might get thoughts by spinning the Wheel of Fortune. Although there’s a random chance of getting one, still there’s no harm in trying a free spin to get it. Reaching a new level will also earn you some extra thoughts and may also unlock a brand new thought. You will need XP (blue stars) to level up. You can get these blue stars by completing jobs, installing new furniture. You also get some stars when you collect a thought. Tap the market and then tap the “Create a Sale” circle. Choose a thought or item that you don’t need. Set the quantity. 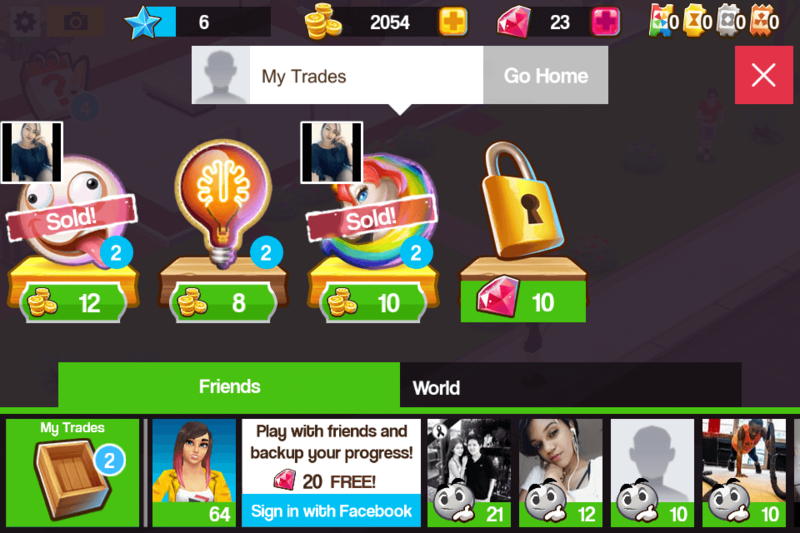 If you have multiples of one thought, you can sell more than one to get more coins. Under price, tap the plus icon and keep tapping it until it stops at a certain price. This is the highest price you can sell the thought or item and the game decides it. For example: The max price for the 4 “Fun” thoughts is 20 coins. You can set a lower price if you want to sell it quickly, but if you have patience and can wait for hours, just sell it at the maximum price. Special jobs are rare and appear only once each day. They are colored yellow and usually grant more coins/XP than normal jobs. Completing a special job also earns you a goody bag, which contains gems and extra coins. A goody bag may also contain collectibles and even vouchers! Jobs require certain special items, so make sure you have those workstations ready and have enough thoughts to make those items. In this game, you will make new friends and complete fun quests, but the real fun lies in decorating your home. Home Street provides various ways to adorn your dream home, such as installing bathroom fittings, enhancing your living room with bedside tables, lamps, double-beds etc., decorating your kitchen with snazzy countertops, tables and sinks. The game also lets you rotate camera, zoom-in, zoom-out and get a bird’s eye view of your home. 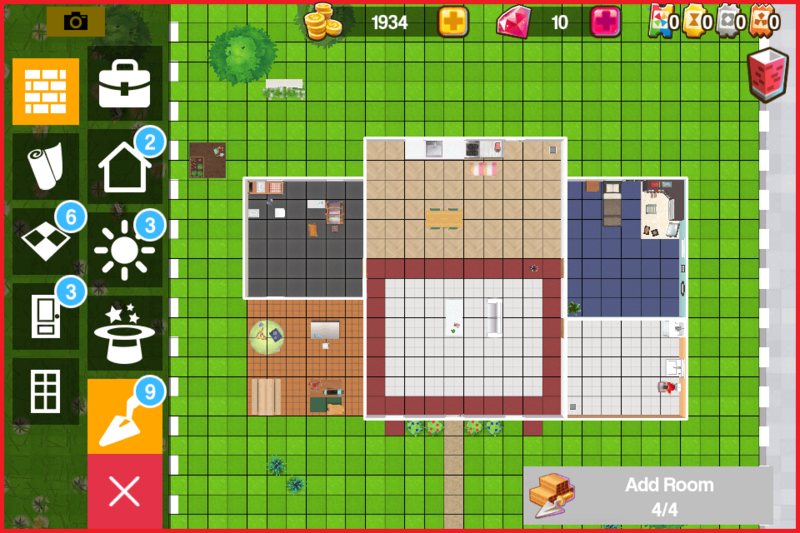 Just tap the Trowel icon to get a top-down perspective of your home. Giving a birds-eye view, the game lets you add tiles and change room dimensions by dragging the borders of a room or add/remove rooms. However, the top-down mode only limits you to the above changes. I would have loved moving furniture in this view, but you can do this only in isometric view. The good news is that the game lets you rotate the screen using two fingers, and this will make it easy for you to install new furniture, move (press until the green arrow disappears to move a furniture) and change them. Those were some beginner-level Home Street tips. Do leave your comments if you have any questions or doubts.